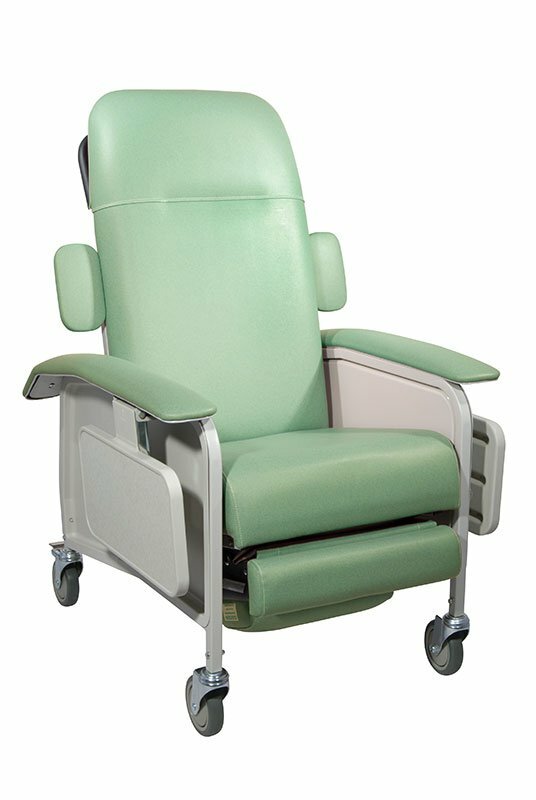 Drive Medical Clinical Care Jade Geri Chair Recliner which is manufactured by Drive Medical. Drive is a leading manufacturer of Home Medical Equipment products. At ADW Diabetes, we offer a complete product line by Drive Medical. This clinical care Geri chair recliner by Drive Medical is ideal for use in dialysis, blood collection, respiratory and cardiac care. It shifts into four positions: upright, TV, full recline and Trendelenburg. Both recline and Trendelenburg positions are controlled by a gas cylinder and can only be attained by an attendant and a convenient release handle can be operated from either side of the recliner. The product includes a large, blow-molded tray that includes a recess for a cup. The comfortable "built-in" headrest and wide, comfortable, padded arm rests were constructed at an angle to provide support, even in a reclined position. The 5" casters (2 complete with locks) allow for simple movement and security of the recliner. With a neutral-colored, sturdy steel frame, the chair is easy to clean and maintain, with side panels that pop off for cleaning and maintenance. All foam and vinyl meet California Flammability standards, and the product also meets both standard and Boston Fire Department specifications. Armrest to Floor Height: 26.5"